What if teachers could tell stories? 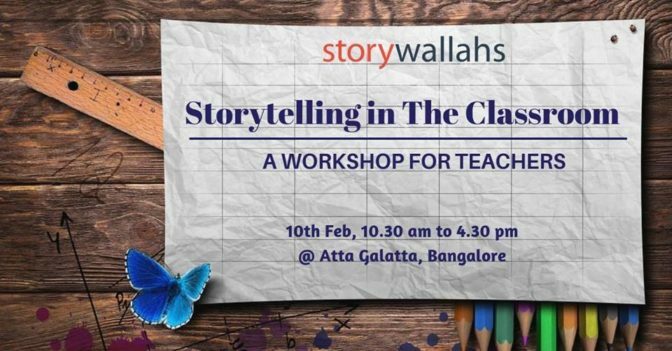 What if teachers could make a whole new world come alive through stories? What if teachers could teach through stories? It is the teacher who makes a subject interesting. And the ability to teach through stories not only makes the teacher and subject interesting, but also makes learning fun, easy and memorable. After all, we forget what we learn through rote but remember stories for life. Last date for registration is 6th Feb 2019. The workshop is limited to 15 participants. For queries, drop a mail to navnita@storywallahs.com or call 96325 10126. For discounts on group registrations of 3 or more, write to us. Expressive Writing WorkshopBook Launch & Book Reading of "A Piece of Him"